On March 23, the Downtown Seattle Transit Tunnel (DSTT) will convert to Link light rail trains only, and bus service will be moved to surface streets. At the Archives, we’re reminiscing over these photographs of its construction, showing a glimpse of 1980s Seattle and the people who built the tunnel. As construction began, Metro staff took photographs of the interior and exterior of buildings along the tunnel’s route, ostensibly to document the current condition of the structures. During construction, thousands of photographs were taken, in a variety of formats, to document the complex work required to dig the tunnel and prepare it for service. The photographs below are from the project files and were taken by Ray Halvorson, Ed Hunter, Norm Nelson, Vic Oblas, Keith Nordlund, and Merdad Shahverdi. The following photographs were taken by Norm Nelson and Vic Oblas. The photographs below are from Printing and Graphic Arts. Photographers include Ned Ahrens, Tim Healy, and Barton L. Attebery. As we say bon voyage to the buses leaving the tunnel, contact the Archives for more information about the photographs above, to make an appointment to see more, or to ask an archivist about anything else related to King County history! Above: Metro Bus, 1978. A10-024, King County Metro Historic files, King County Archives. Today an industry leader in public transit, Metro has been shaped by citizen involvement since its establishment by the voters of King County 60 years ago. One significant area of Metro leadership and citizen engagement has been the development of accessible transit services for people with disabilities. The Municipality of Metropolitan Seattle (“Metro”) was formed in 1958 with a public mandate to improve local water quality. Over time, Metro expanded to other civic projects and services. The Forward Thrust bond campaign, headed by community activist James Ellis, promoted a range of regional projects, such as development of parks and pools and the construction of a multi-use stadium, the Kingdome. In 1968, a proposal for a regional integrated transportation system was brought to the voters as a Forward Thrust bond measure. The first two Forward Thrust transit referendums, in 1968 and 1970, were rejected by voters facing an uncertain economy. 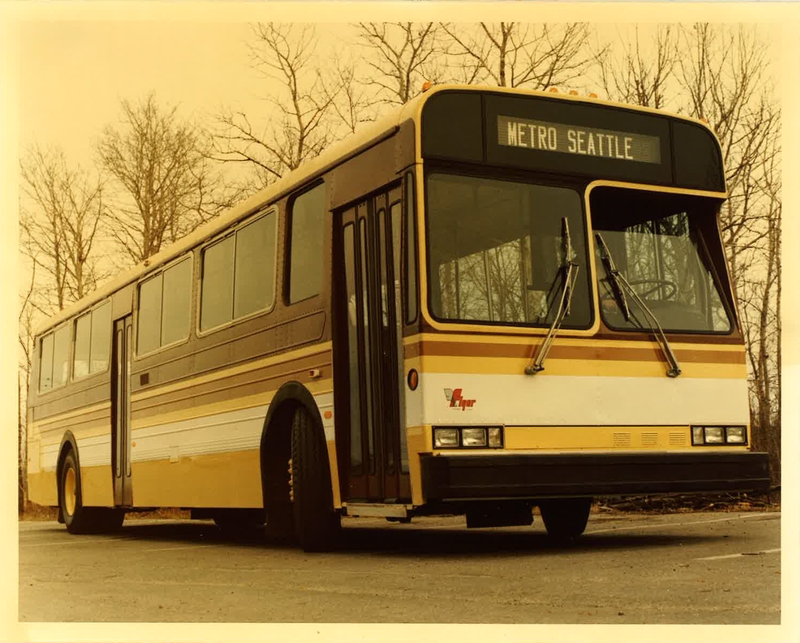 But in 1972, King County voters authorized Metro to expand its services and operate a regional bus system that would incorporate the Seattle and Overlake transit systems. Above: King County Council Motion 900, August, 1972, endorsing the Forward Thrust transit plan. County Council Motions, Series 306, Box 11, 1972, King County Archives. Above: Schematic of regional transit system, circa 1972. A10-024, King County Metro Historic files, King County Archives. 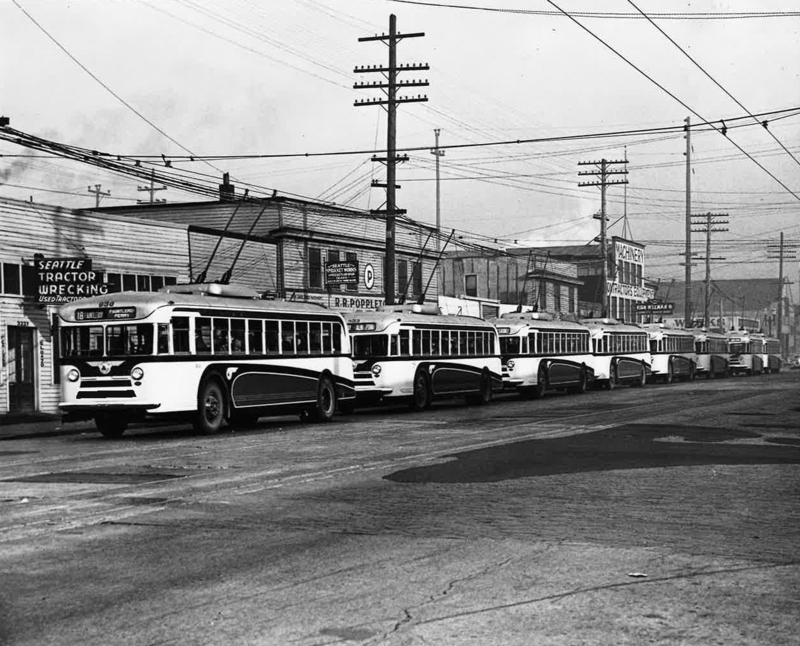 Above: Trolley buses in Seattle, 1941. A10-024, King County Metro Historic files, King County Archives. Above, Seattle Transit bus, 1948. A10-024, King County Metro Historic files, King County Archives. Civic activism has a long history in the Northwest, and the development of the new Metro transit system in the 1970s was no exception. Residents debated the merits of electric trolley versus diesel and the practicality of articulated buses. They weighed in at meetings and in newspaper articles and letters to editors. Above: From “Metro Proposal Not a Diesel vs. Trolley Issue,” Seattle P-I, August 24, 1972 p. 12. Misc. clipping for graphics, A10-024, King County Metro Historic files, 1970-1979, King County Archives. Above: Cartoon by Alan Pratt appearing in the Seattle Times [ca. 1972]. Misc. clipping for graphics, Accession A10-024, King County Metro Historic files, 1970-1979, King County Archives. Above: Metro Transit Express, circa 1973. Series 1247, Department of Transportation, Office of the Director, Box 1, DVD 001, King County Archives. 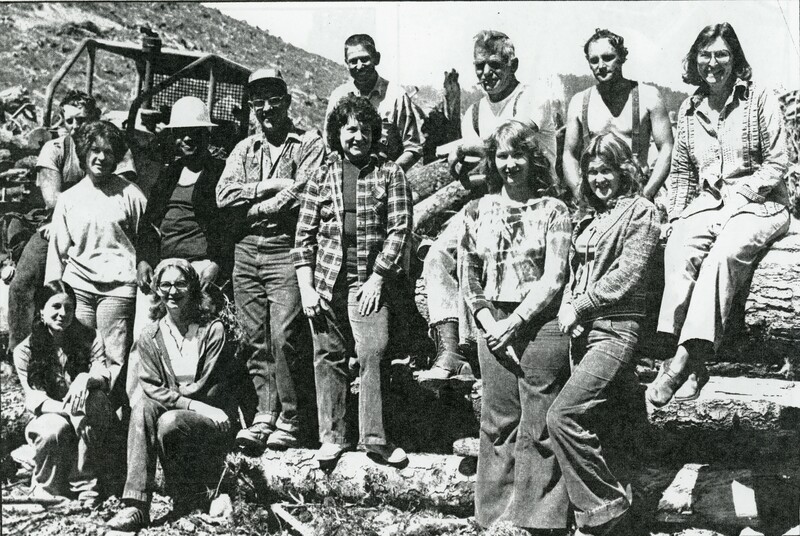 In in the mid-1970s, the Elderly and Handicapped Transportation Project task force was formed. In keeping with the active civic involvement in the development of the transit system, the group consisted of a Citizens Action Committee working with advisors from Metro, King County, and the City of Seattle. The group studied ways to make public transportation accessible to people with disabilities. The project report included input from local service organizations, transportation professionals and the general public. Their findings, published in 1976, laid out not only the significant physical and economic barriers to access, but social/psychological and administrative/bureaucratic ones as well. 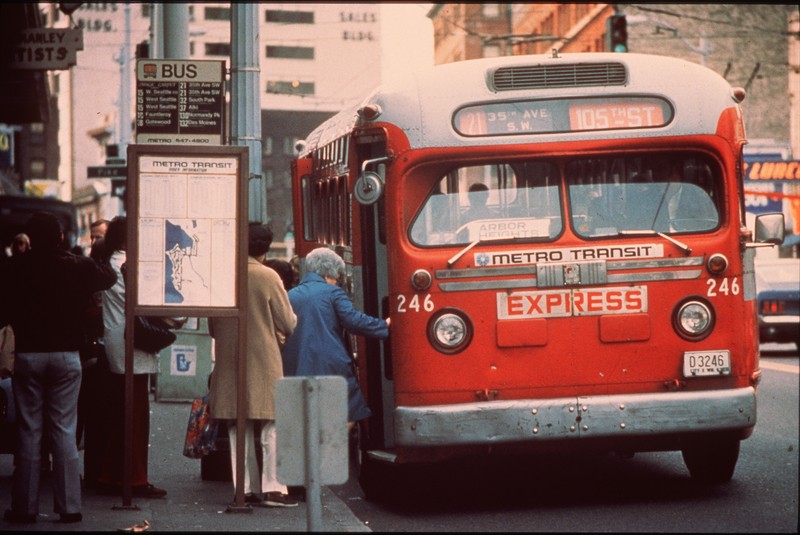 In 1975, Metro put out a bid for 145 new buses to expand the system. Before it was finalized, John Martin, a University of Washington student with disabilities, requested a restraining order on the bid. Martin argued that without including access for persons with disabilities Metro was violating state laws that prohibit discrimination in public transportation. The restraining order was rejected by the court as not reflecting an emergency situation, but Martin was later called to testify at Metro hearings on the subject. Martin’s protest brought attention to the issue of accessible transit. Metro subsequently revised the bid to include a requirement for wheelchair lifts on all 145 buses. 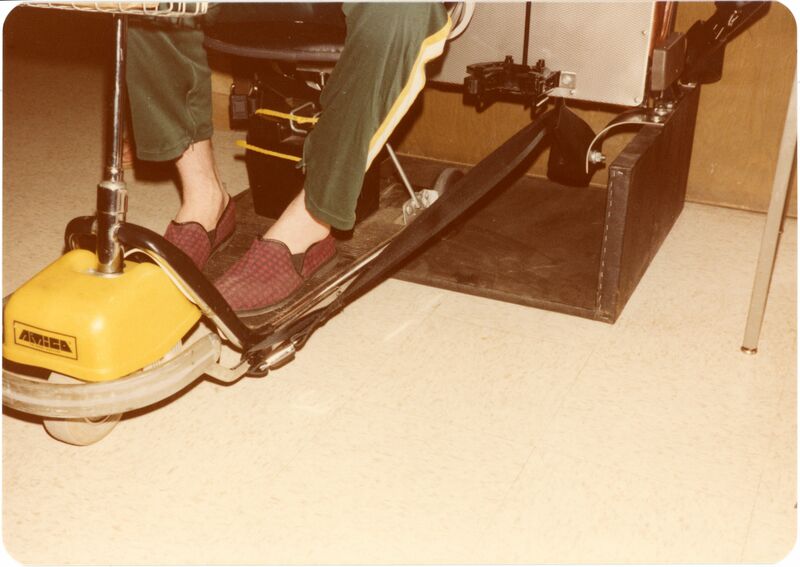 In 1980, the buses, newly outfitted with wheelchair lifts, arrived. 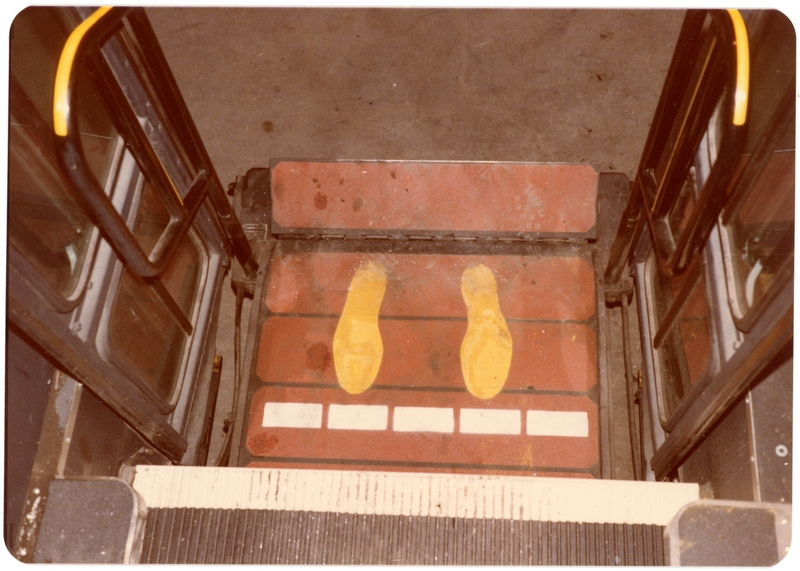 The initial wheelchair lifts installed turned out to be flawed, however, and the first buses including them were rejected. Newspaper clipping: “Metro gets go-sign on bid for 145 buses.” A10-024, King County Metro Historic files, King County Archives. 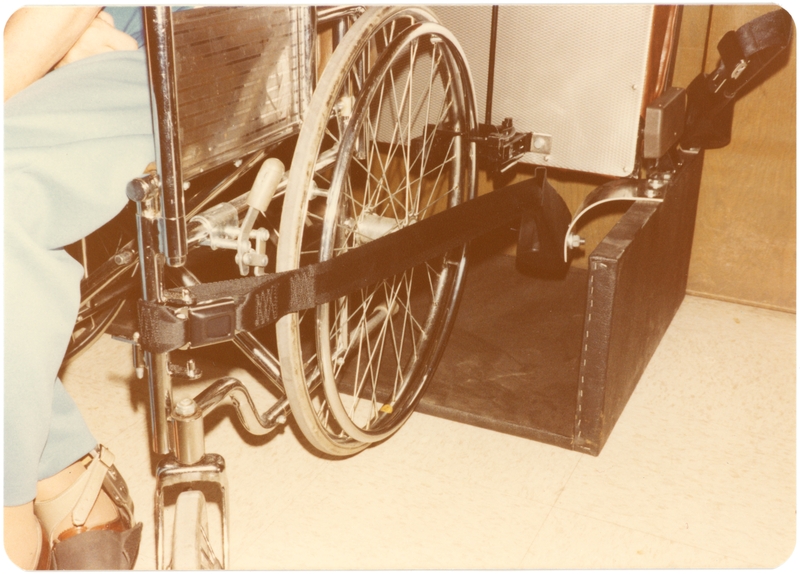 Above: Modifications to Flyer model bus for wheelchair lift, 1979. A10-024, King County Metro Historic files, Box 2, King County Archives. Metro committed to finding a wheelchair lift that would work – and put significant effort into making it happen. This was at a time when the majority of transit agencies were not supporting the move toward lift-equipped fleets. A former Boeing engineer, Ed Hall, became interested in the problem and experimented in his garage with lift designs for public transportation. Hall’s successful design, marketed under the name “Lift-U”, was approved and his wheelchair lifts were installed on the new Metro buses, and eventually on the entire fleet. 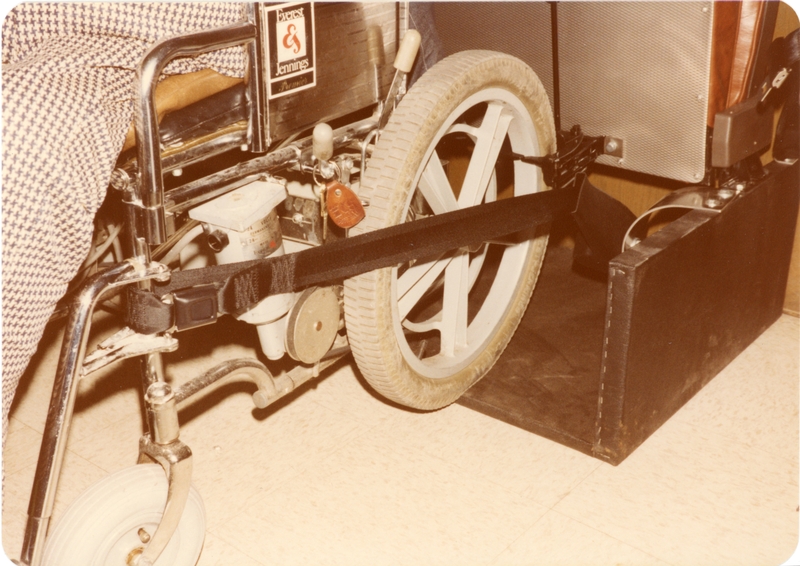 Above: Photographs showing belt securing wheelchair in bus, 1981. A10-024, King County Metro Historic files, Box 2, King County Archives. In 1978, Metro applied for and received $1.7 million in Federal Urban System funds to put in place improvements at bus zones, including ramps and other aids for disabled riders. In addition to the inclusion of wheelchair lifts, Metro staff, working with a Metro advisory committee of blind and deaf-blind transit users, pioneered the use of Bus Identifier cards for blind, deaf-blind and limited English speaking riders. Transit operators were trained in the specific needs of these groups. Along with accessible buses and services tailored to specific groups with disabilities, a fleet of vans, operating jointly between Metro and local service organizations, were acquired to provide door-to-door service for disabled riders. Access Van, A10-024, King County Metro Historic files, Box 2, King County Archives. In 1990, the Americans with Disabilities Act (ADA) was ratified in Congress and signed into law by President George H. W. Bush. The Act codified the rights of individuals with disabilities to equal access to employment, transportation, public accommodations, communications and access to state and local government programs and services. The road to the ADA had been long one. Equal access in public transportation had first come to the public eye many years before, spurred by the Urban Mass Transit Act of 1964. A later revision in 1974 included provisions for accessible access, but it was not until the late 1980’s that congress took the steps that led to the passage of the ADA. In 1992, King County voters approved the merger of Metro and King County government, bringing Metro transit services into a new County Department of Transportation. A special task force established at the request of the County Council reviewed Metro’s paratransit programs, both to ensure their compliance with the law and to identify potential cost savings where the needs of seniors and people with disabilities might be met through changes to the overall transit system or through other programs. A Council report showed that at the time of the ratification of the federal American with Disabilities Act in 1990, paratransit services had accounted for 1% of the Metro transit budget. The report projected that by 2004, that percentage would rise to 11%. Representatives from King County’s Accessible Services Committee, senior and disability interest groups, and the general public participated on the task force, and input was sought from Metro transit customers. 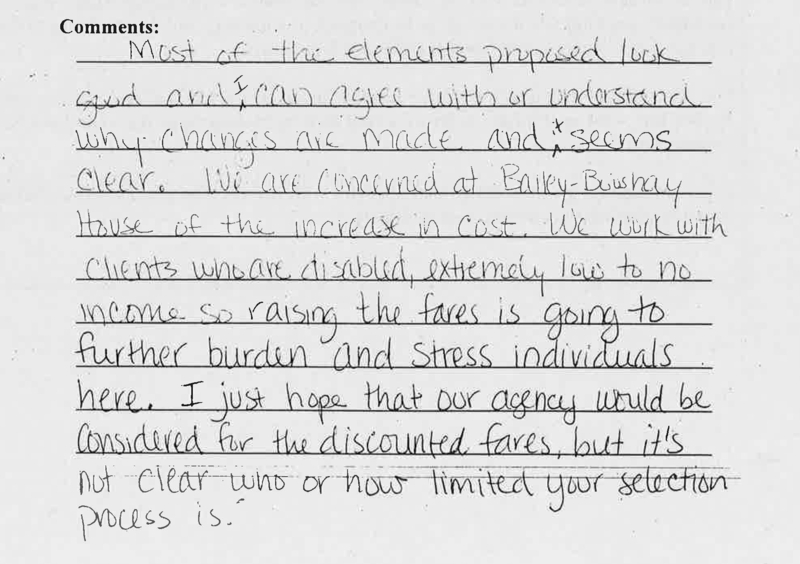 Excerpts from public comments regarding proposed changes to Access transportation’s paratransit program, submitted to the King County Special Transportation Services Task Force in 1998 and 1999. A11-028 Department of Transportation, Transit, Paratransit policy background, 1997-1999, Box 2, King County Archives. 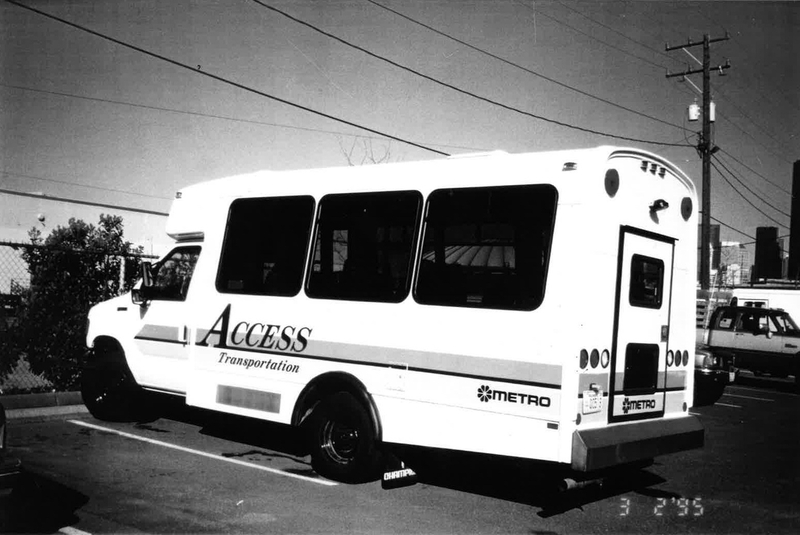 From Metro Transit’s earliest days, Metro drivers received training in how to serve riders with disabilities. The below excerpts from training videos in the Archives collection instruct drivers not only in policies and procedures, but also in the importance of treating all riders with respect. 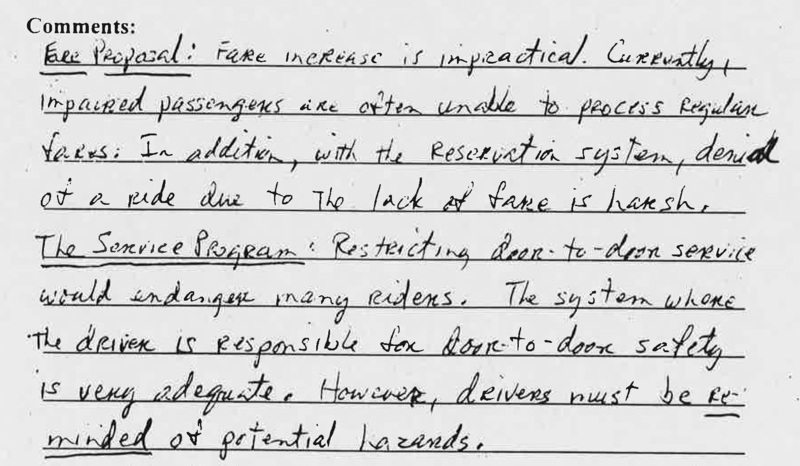 Outtakes from “Metro Regional Reduced Fare Permits,” 1995, Metro. A17-035 Department of Transportation, Transit / Paratransit Rideshare Operations, Outreach and training videos, King County Archives. The following video provides Access drivers training in serving passengers with disabilities who use letter boards to help communicate. Outtakes from Metro Access driver training video, “Communications with Letter Boards,” (circa 2000), King County Metro. A17-035 Department of Transportation, Transit / Paratransit Rideshare Operations, Outreach and training videos, King County Archives. Access was providing more than 1,000,000 trips to King County residents by 2006. That year, King County Executive Ron Sims ceremoniously presented keys to 21 new vans, paid for by a grant from the Washington State Department of Transportation, to local service agencies such as Senior Services, Puget Sound Essential Services, and Providence Elder Care. King County Executive Ron Sims presenting Access van keys to non-profit agencies, 2006. A17-035 Department of Transportation, Transit / Paratransit Rideshare Operations, Outreach and training videos, King County Archives. Today, Metro accessible services, including Access vans, provide over 1.3 million trips per year. 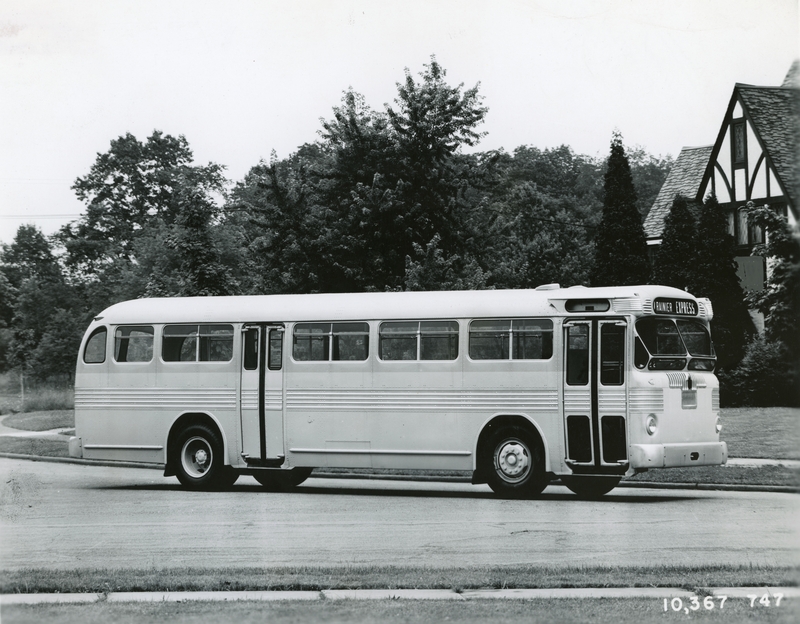 Community involvement was influential in the development of the regional transit system and the push to provide services to the disabled community. Thanks to the collaborative work of the task forces and the contributions of civic minded residents, King County Metro provides services beyond the requirements established by ADA. Citizens continue to have an important influence in shaping Metro’s transit and paratransit services. The Transit Advisory Commission, comprised of King County residents, plays an active role in consulting and advising the Regional Transit Committee. In addition, Metro is forming an Access Community Advisory Group to help Metro strengthen its Paratransit Access service. This post is based on documentation in the King County Department of Transportation’s historical files, records of the King County Council, and other series in the King County Archives collection. 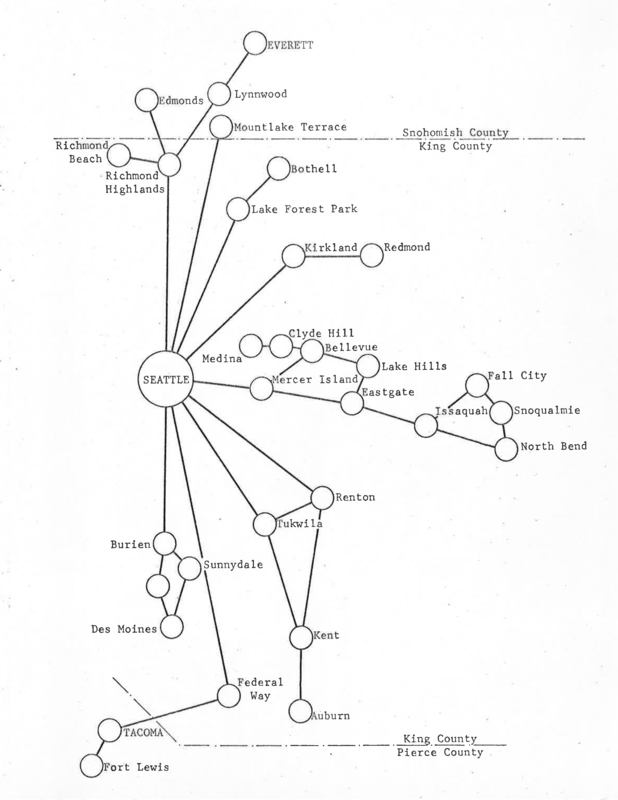 Note that the majority of historical records from the Municipality of Metropolitan Seattle, prior to merging with King County in 1994, and Seattle Transit are held by the Puget Sound Regional Branch of the Washington State Archives. Please feel free to contact us with your research questions! Clipping from a south King County newspaper covering the Women’s Program’s “Displaced Homemaker” job training program, 1979. Women’s Program Coordinator Files, Series 1901, Box 2, Folder 10. Archives staff recently completed processing a collection of records documenting the establishment and evolution of the King County Women’s Program. A new online exhibit, The King County Women’s Program: The First Years (1978-1985) highlights these records. The exhibit begins with a timeline that places the Women’s Program in the context of the national and international women’s movement and second-wave feminism. In the program records, we see both local support and local objection to the women’s movement. Yet the services provided by the program were more practical than political, and they addressed the needs of women throughout the County. Earliest priorities centered on women’s self-image, confidence and assertiveness; jobs, training, and vocational planning; child care; dissemination of community resource information; and programs for women of color. Over time, priorities shifted to providing specific, targeted programs intended to increase the safety of women victims of domestic violence and/or sexual assault. Today, the King County Women’s Advisory Board continues to make recommendations to the County Council and the County Executive to ensure that the needs, rights and well-being of women are taken into account by King County government. Online exhibits allow us to provide broad public access to the King County Archives collection. Relatively few people will ever visit an archives, but we can make these public assets, the County’s historical records, more widely accessible by sharing some of the collection online. We also encourage researchers to visit us and see the records in person. Check out more exhibits on our Web site at www.kingcounty.gov/depts/records-licensing/archives/exhibits. Leadership and activism: the King County logo honoring Dr. Martin Luther King, Jr.
King County logo adopted February 27, 2006. Dr. King fought for Black Americans to be treated equally by their government. He envisioned a world where “little black boys and little black girls will be able to join hands with little white boys and little white girls as sisters and brothers” and where justice, peace and equality were afforded to all people. As County employees, we hope serve our communities in a way that is just, fair and inclusive of all of our residents. We proudly display the image of Dr. King on our websites, written materials and buildings. 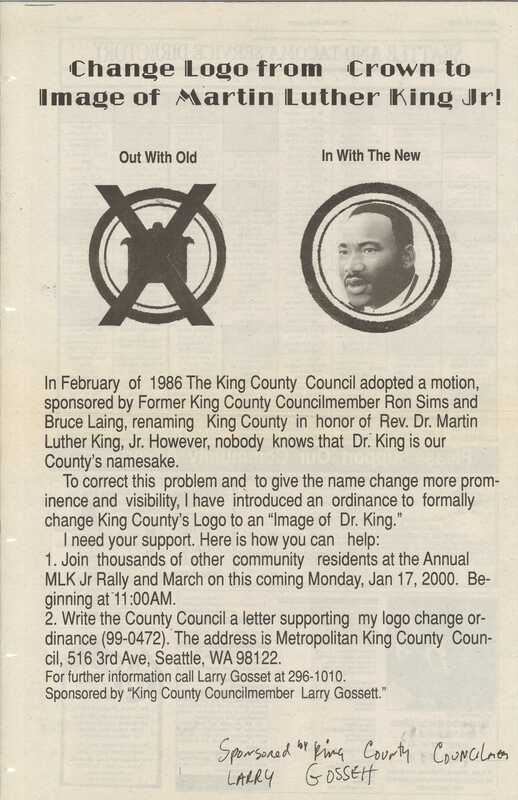 But Dr. King’s likeness was not always the County logo. So, how did we get here? The King County Archives has a collection of records related to the events that led up to adoption of the current logo on March 12, 2007. Originally, in 1853, King County was named after Vice President of the United States William Rufus DeVane King, a slave owner and supporter of the Fugitive Slave Act. 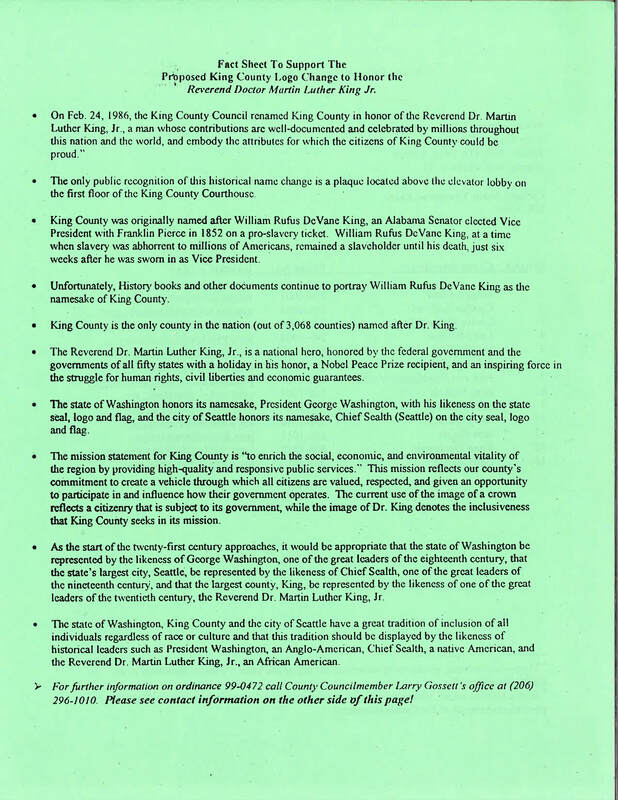 For 134 years, King County carried his name until 1986 when Councilmen Ron Sims and Bruce Laing introduced proposed Motion 86-66 (adopted as Motion No. 6461) to the Council. King County Council Motion 6461, adopted February 24, 1986. Series 306, King County Council Motions, Item 306.101.37, King County Archives. It read in part, “NOW, THEREFORE, BE IT MOVED by the Council of King County: The King County Council, Hereby, sets forth the historical basis for the ‘renaming’ of King County in honor of Reverend Dr. Martin Luther King, Jr., a man whose contributions are well-documented and celebrated by millions throughout this nation an world, and embody the attributes for which the citizens of King County can be proud and claim as their own.” Motion 6461 passed on February 26th, 1986. 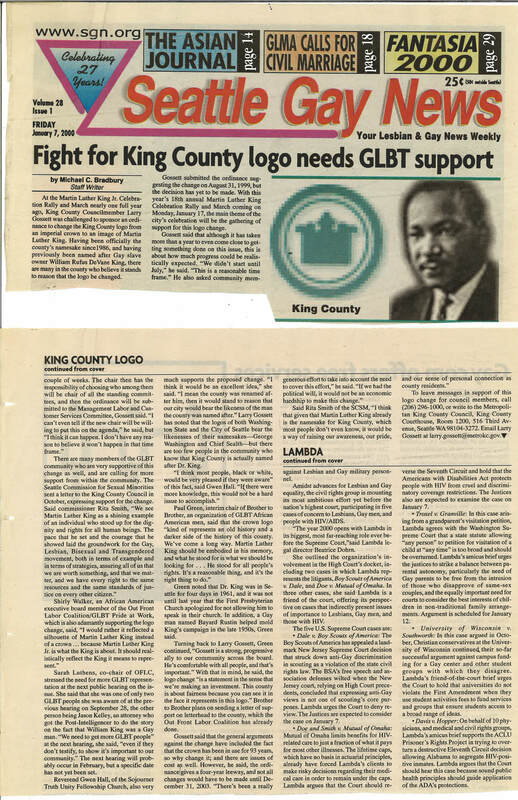 The imperial crown remained the logo for our County, and over the next two decades, with a significant movement beginning in 1999, community members and County leaders worked to make Dr. King’s image the official logo of King County. The records of Councilmember Larry Gossett document the movement. 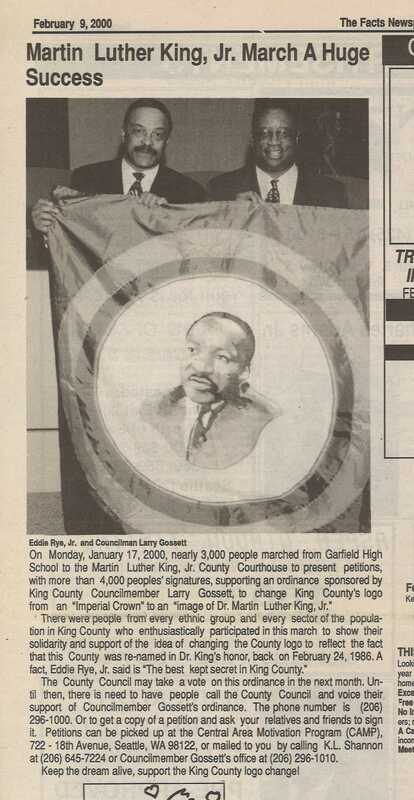 “at the 17th annual Martin Luther King Celebration Rally and March at Garfield High School, a crowd of 2,000 people challenged me to sponsor an ordinance to change the logo” — Councilmember Larry Gossett letter to constituents, September 13, 1999. 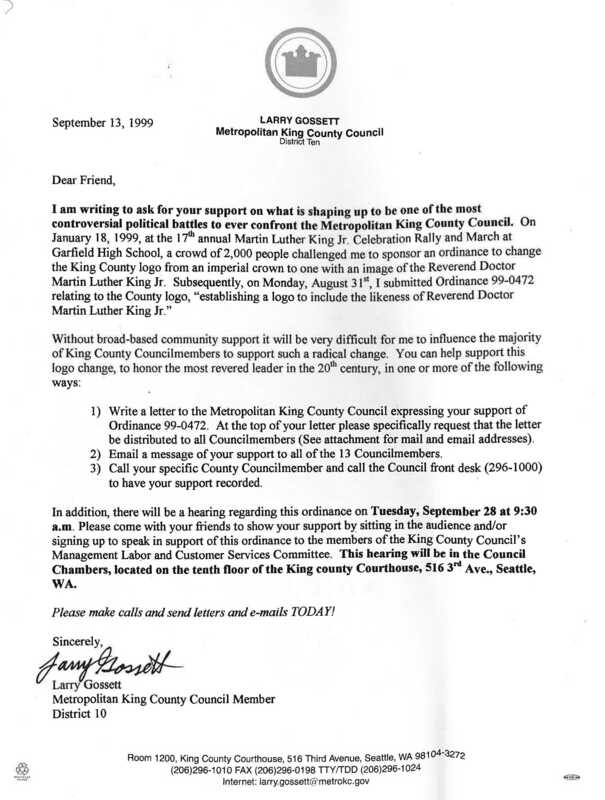 Letter from Councilmember Larry Gossett, September 13, 1999. Series 555, Larry Gossett administrative working files, Box 4, King County Archives. Clipping from The Facts Newspaper January 17, 2000. Series 555, Larry Gossett administrative working files, Box 4, King County Archives. Clipping from The Facts Newspaper, February 9, 2000. Series 555, Larry Gossett administrative working files, Box 4, King County Archives. The effort to change was not without controversy. Some people questioned the need to spend tax dollars to pay for a logo change when the name change was adopted back in 1986. In a letter to supporters, Councilman Gossett warned of the potential for an uphill battle. Fact sheets were provided to help supporters advocate for the change. 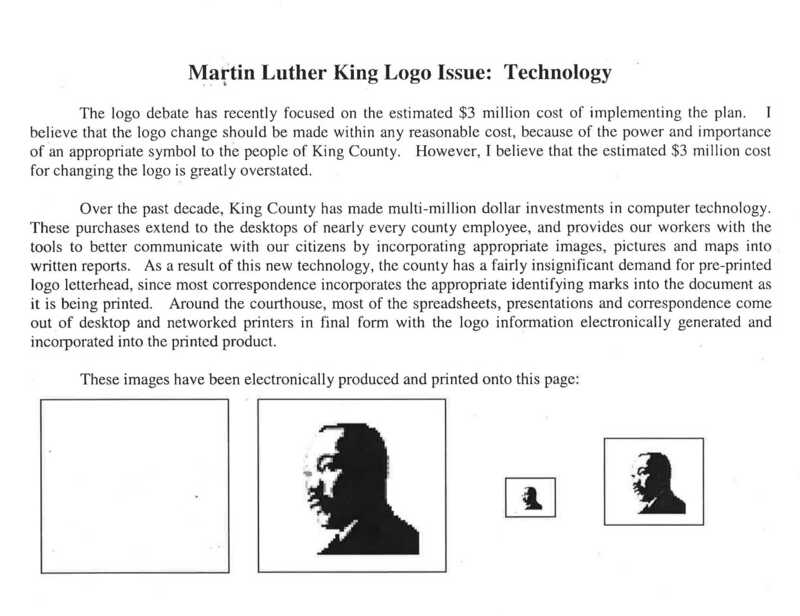 Detail from fact sheet from Councilmember Gossett’s Office for use in advocating for the logo change, circa 2000. Series 555, Larry Gossett administrative working files, Box 3, King County Archives. One flyer argued that the three-million dollar estimate for the logo change did not account for new low-cost printing technology and a plan to use up existing printed material. Known as a bridge builder, Councilmember Gossett over time was able to secure support from a diverse group of community members and politicians. Detail from first of six-pages listing individuals and organizations supporting the logo change, circa 2000. Series 555, Larry Gossett administrative working files, Box 3, King County Archives. Clipping from the Seattle Gay News January 7, 2000. Series 555, Larry Gossett administrative working files, Box 4, King County Archives. Another issue that needed to be addressed was the State of Washington’s formal recognition of the 1986 name change. After mounting public pressure, the State of Washington made it official on July 24, 2005. Because of the work of elected officials and our diverse community members, we are able to work for a County whose values can be recognized and understood by simply looking at our logo. Archival records document this history. To quote Maya Angelou, “The more you know of your history, the more liberated you are” and for that reason, we must protect and preserve it. For more on the history of the King County logo, see King County’s page, background about the logo. See also proclamations of February, 2017, as Black History Month by the King County Council and by King County Executive Dow Constantine. Enter your email to subscribe to the King County Archives blog and get notifications of new posts by email.